Good morning and Happy Cat-ur-Day!! A little turquoise, a big splash of extra PEACH and Voila! 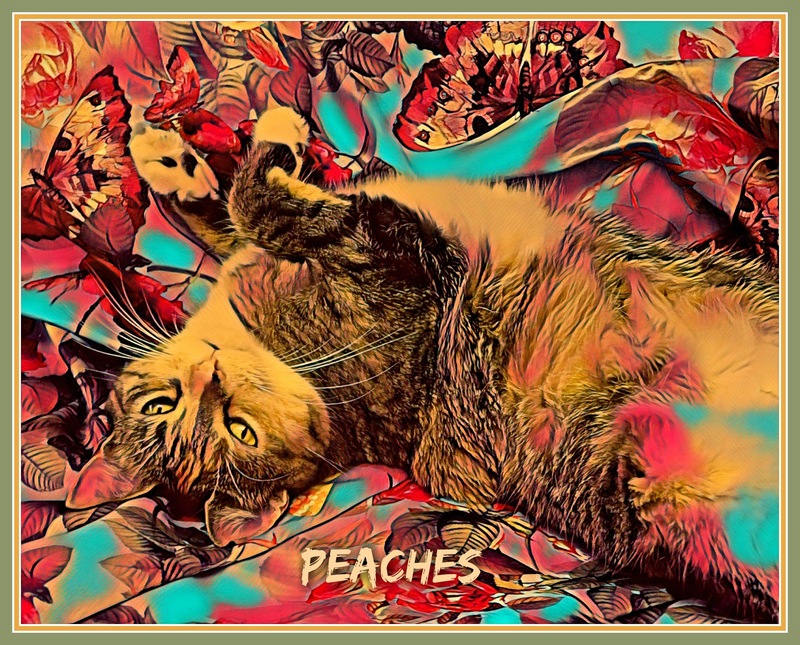 A new turquoise Peaches! Do you like the new (but temporary me?! Believe it or not, we're expecting snow here in Connecticut but hope spring will be here soon. 1. I admire people who rescue pets from the "last chance" lists at kill shelters. Because that's how I met Peaches & Paprika who are originally from NYACC. These angels, share the pets' pictures and pledge money and never stop trying. The people who rescued then (that I know about) in 2012 are still my Facebook friends. 2, I can't wait for tulips to bloom. My favorite flower ever. 3. I'm proud to say i was a finalist in one of the CWA competitions (photo art) . 4. Not having enough structure in my life makes me nervous. I like to have at least a few things planned out. Being retired has been a challenge. 1. I admire my sister Peaches for her glamorous poses. Sometimes I try them out myself. But she's the queen. 3. I'm proud to say I can still get on top of almost anything in this house and out jump my sis-fur Peaches ANY time. 4. Being picked up makes me nervous. I like to run away and come back and then run away again. 1. I admire my own self of course. He he...but it's true, I can't help it! I'm a charmer. 3. I'm proud to say my human still adores my weird meows as I run around the house like a maniac and and continues to admire mytummy poses showing all my white furs. 4. Visitors make me nervous. Cuz i wonder how much of my human's time they'll take up. I usually inspect all visitors before i leave them alone with my human. Good answers gang and pretty art too! Super Fill-ins and really nice art! I love the turquoise art very much! Love the answers and I agree with your mom about structure. You look lovely with added turquoise and extra peach. Great fill ins from all three of you. Beautiful and we like your fill-ins! You have my award for my fave art of the week! I'm happy that I share one answer with each Peaches and Paprika.